For other people of the same name, see Joshua Johnson (disambiguation). Joshua Michael Johnson (born January 31, 1984), nicknamed "JJ", is a Canadian-American starting pitcher with the San Francisco Giants organization. He has pitched in Major League Baseball (MLB) for the Florida/Miami Marlins and Toronto Blue Jays. Johnson graduated from Jenks High School in Jenks, Oklahoma in 2002, when he was Tulsa World All-Metro Player of the Year. He helped lead the Trojans to two State Championships during his high school career. 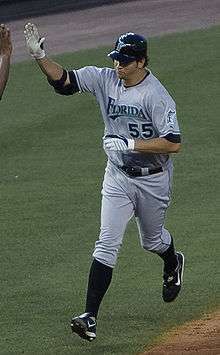 Johnson was drafted by the Marlins in the fourth round of the 2002 amateur draft. The righty made his professional baseball debut soon after with the Gulf Coast Marlins, earning a 0.60 earned run average (ERA) over 15 innings. As a starter with Single-A Greensboro during the 2003 season, Johnson continued to limit his opponents' offensive numbers, collecting a paltry .223 opponent batting average. In 2004, he saw more success with Single-A Jupiter. Despite a 5–12 record, Johnson's ERA remained a solid 3.38. His performance at the Single-A level earned Johnson a promotion to Double-A Carolina in 2005. He was named the Marlins' Minor League Pitcher of the Year  after a 12–4 record, a 3.87 ERA and a Southern League All-Star nod for Carolina. Johnson made his major league debut September 10, 2005, for the Marlins with a scoreless inning of relief against the Philadelphia Phillies. During the 2006 season, Johnson broke onto the Major League scene by going (11–5) as a starter, while tallying a 3.03 ERA in that role. After spending all of April in the Florida bullpen, Johnson emerged as a major contributor in the Marlins' young, but surprisingly successful, starting staff. In 2006 Johnson and fellow Marlin pitchers Scott Olsen, Aníbal Sánchez and Ricky Nolasco became the first quartet of rookie pitchers in major league history to each record 10 wins. He sat out the final three weeks of the season with forearm stiffness. His 3.10 overall ERA would have tied him for third in the National League, but he fell five innings short of qualifying for the title. Johnson also placed fourth in voting for the National League Rookie of the Year, an award that went to his fellow Florida teammate, shortstop Hanley Ramírez. Johnson began the 2007 season on the disabled list with an irritated ulnar nerve. After returning in June, he was again sidelined by elbow stiffness in July and had Tommy John ligament-replacement surgery on August 3, 2007. He recovered surprisingly quickly and made his return to the Major Leagues on July 10, 2008, only eleven months after having undergone surgery. He made 14 starts in 2008, posting a 3.61 ERA. Johnson hit his first career home run off of Milwaukee's Dave Bush on June 4, 2009. On July 5, 2009, Johnson was selected to the National League All-Star squad for the first time but did not play in the game. On August 14, Johnson took a no-hitter into the 7th inning against the Colorado Rockies, but it was broken up by a Garrett Atkins home run. He finished 2009 with a 15-5 record and a 3.23 ERA with 191 strike-outs in 209 innings. On January 15, 2010 Johnson agreed to a four-year contract with the Marlins worth $39 million. On May 29, 2010, Johnson lost to the Phillies 1–0, as Roy Halladay threw a perfect game. In July 2010, he was selected to his second consecutive All-Star Game, which took place in Anaheim. Johnson pitched two perfect innings in the game, notably striking out Derek Jeter and Ichiro Suzuki. 2010 was also a record-setting year for Johnson, who gave up three runs or less in twelve consecutive starts. On the 28th of July, Johnson had started 21 games, and in those starts, only allowed more than three earned runs once, giving up only one earned run eight times and no earned runs six times. Johnson finished the 2010 season second in the Majors in ERA (2.30), leading the National League, trailing only Félix Hernández of Seattle. He finished 11–6 with 186 strikeouts in 28 starts, his year shortened by back pain. He made his final start of the season on September 4 against Atlanta. At the beginning of the 2011 year Johnson kept a no-hitter at least to the fifth inning four out of the first five times he took the mound. The high point being the game against the Atlanta Braves in which Johnson went into the eighth until there was a broken bat single by Braves hitter Freddie Freeman. His 2011-year ended short as he missed the rest of the season due to a right shoulder inflammation. In 2012, Johnson was named the Opening Day starter for the Marlins for the third straight year, although he was coming off from a shoulder inflammation injury. On April 4, 2012, Johnson pitched 6 innings against Kyle Lohse and the St. Louis Cardinals in the Marlin's first game in Marlins Park. Johnson finished his last season with Miami with an 8–14 record and an ERA of 3.81. On November 19, 2012, Johnson was traded to the Toronto Blue Jays along with Mark Buehrle, José Reyes, John Buck, and Emilio Bonifacio, in exchange for Jeff Mathis, Adeiny Hechavarria, Henderson Álvarez, Yunel Escobar, Jake Marisnick, Anthony DeSclafani, and Justin Nicolino. On February 5, 2013, manager John Gibbons named Johnson the number 4 starter for the upcoming season. Johnson made 4 starts for the Blue Jays before missing a start on April 26, due to a sore right triceps muscle. He was expected to make his next scheduled start but was instead placed on the disabled list due to inflammation. Ricky Romero was called up to take his place in the starting lineup. He had one rehab start for the Class-A Dunedin Blue Jays before being moved to the Triple-A Buffalo Bisons for his second rehab start on May 25. This was his debut at the Triple-A level, as he had skipped that level while in the Marlins' organization. On May 31, the Blue Jays announced that Johnson would be activated from the disabled list and start against the San Francisco Giants on June 4. Johnson pitched 7 innings in his return from the disabled list and took the loss, allowing 2 runs (only 1 earned run), with no walks and 6 strikeouts. Johnson earned his first win as a Blue Jay on June 23 against the Baltimore Orioles, which extended the Jays' winning streak to 11 games, tying the franchise record. After earning his first win, Johnson lost 6 consecutive starts, the longest such streak of his career. During his losing streak, his ERA rose from 4.60 to a career-high 6.60. Johnson earned his second win of the season on August 6, against the Seattle Mariners. He was scratched from his scheduled next start on August 12 due to forearm tightness, and was placed on the 15-day disabled list on August 13. Johnson finished the 2013 season on the disabled list, and posted a dismal 2–8 record, a 6.20 earned run average, and 83 strikeouts over 81 1⁄3 innings. On October 1, 2013, Johnson underwent surgery to remove bone spurs from his right elbow. The surgery was performed by Dr. James Andrews and required 5 weeks of recovery. On November 19, 2013, Johnson agreed to a one-year, $8 million contract with the San Diego Padres. If he made fewer than 7 starts with the team, they could have exercised a $4 million option for the 2015 season. The Padres organization reported on March 22, 2014, that Johnson would open the season on the disabled list due to a strained right forearm/elbow muscle, and was initially expected to miss at least 4–5 weeks. On April 15, it was announced that he would see Dr. James Andrews for a consultation on his injured elbow, and could opt for his second Tommy John surgery. The Padres reported on April 23 that Johnson would undergo Tommy John surgery, and miss the 2014 season. On October 30, the Padres declined Johnson's option, making him a free agent. On January 7, 2015, he re-signed with the Padres on a one-year contract with $1 million guaranteed. Johnson threw a simulated game on April 28, but experienced triceps tightness as well as a nerve issue in his neck. He would rest with these injuries until August 27, when he threw 16 pitches in another simulated game. On September 16, it was announced that Johnson would undergo a third Tommy John surgery, and miss the entire 2016 season. Attempting another comeback from Tommy John surgery, Johnson signed a minor league contract with the San Francisco Giants on November 1, 2016. Both of Johnson's parents are Canadian and his father spent his years growing up in Calgary, Alberta before the family relocated to the U.S. Johnson himself was born in Minneapolis a short time later in 1984. ↑ Elliot, Bob (March 15, 2013). "Jays' Johnson could've pitched for Canada". The Toronto Sun. Retrieved March 16, 2013. ↑ "Learn about the new law". April 17, 2009. Retrieved March 16, 2013. ↑ Greg Echlin, "Johnson bounces back: Two years after surgery, Jenks graduate an All-Star", Tulsa World, July 14, 2009. ↑ Rojas, Enrique (September 7, 2006). "Johnson flourishing in first season with Marlins". ESPN.com. Retrieved July 18, 2010. ↑ Frisaro, Joe (September 27, 2006). "Sanchez helps make more history". MLB.com. Retrieved July 18, 2010. 1 2 3 Hadorn, Chris (March 16, 2007). "Josh Johnson, SP, Florida Marlins". KFFL.com. Retrieved March 15, 2014. 1 2 Center, Bill (November 19, 2013). "Padres add Josh Johnson to rotation". U-T San Diego. Retrieved March 15, 2014. ↑ "Marlins' Johnson undergoes Tommy John surgery, out through '08". ESPN.com. Associated Press. August 5, 2007. Retrieved July 18, 2010. ↑ Frisaro, Joe (July 22, 2009). "One year later, Johnson looking forward". MLB.com. Retrieved March 15, 2014. ↑ Capozzi, Josh (August 14, 2009). "Marlins pitcher Josh Johnson has no-hitter broken up in seventh inning". The Palm Beach Post. Retrieved March 15, 2014. ↑ Steve Wine, "AP source: Johnson, Marlins reach $39M, 4-yr deal"
↑ Toman, Chris (February 5, 2013). "Blue Jays set rotation around No. 1 Dickey". MLB.com. Retrieved February 5, 2013. ↑ "Jays put Johnson on DL, recall Romero to start Friday". TSN.ca. May 2, 2013. Retrieved May 2, 2013. ↑ Nicholson-Smith, Ben (May 2, 2013). "Romero back with Jays as Johnson hits DL". Sportsnet.ca. Retrieved May 2, 2013. ↑ Baer, Bill (May 31, 2013). "Blue jays will activate Josh Johnson on Tuesday". Retrieved June 1, 2013. ↑ Chisholm, Gregor (June 4, 2013). "Johnson bested despite strong return vs. Giants". MLB.com. Retrieved June 5, 2013. ↑ "Josh Johnson to DL". KFFL.com. August 13, 2013. Retrieved August 13, 2013. ↑ Davidi, Shi (October 1, 2013). "Blue Jays' Johnson undergoes elbow surgery". Sportsnet. Retrieved October 1, 2013. ↑ "Padres and Johnson agree to one-year, $8 million contract". TSN.ca. November 20, 2013. Retrieved November 20, 2013. ↑ Axisa, Mike (April 15, 2014). "Josh Johnson to see Dr. James Andrews about troublesome elbow". cbssports.com. Retrieved April 16, 2014. ↑ Axisa, Mike (April 23, 2014). "Josh Johnson to undergo second Tommy John surgery". cbssports.com. Retrieved April 23, 2014. ↑ Adams, Steve (October 30, 2014). "Padres Decline Josh Johnson's Option". mlbtraderumors.com. Retrieved October 30, 2014. ↑ "Padres Sign Josh Johnson to One-Year Contract". Padres.com. January 7, 2015. ↑ Lin, Dennis (August 27, 2015). "Johnson throws sim game". sandiegotribune.com. Retrieved August 29, 2015. ↑ Heyman, John (September 16, 2015). "Josh Johnson, aiming for comeback, to have third Tommy John surgery". cbssports.com. Retrieved September 16, 2015. ↑ Adams, Steve (November 1, 2016). "Giants, Josh Johnson Agree To Minor League Deal". mlbtraderumors.com. Retrieved November 1, 2016. ↑ Scott Ferguson (March 29, 2013). "Will the Blue Jays Re-sign Josh Johnson?". TSN. Wikimedia Commons has media related to Josh Johnson (baseball).